I know people have been using light tables and pads for sometime now to help with their weeding and I never thought I needed one and often laughed at the idea. Now that I am in my 50's and my eyes are not as sharp as they use to be I found myself wishing I had a light pad and I couldn't bring myself to spending a lot of money on one. 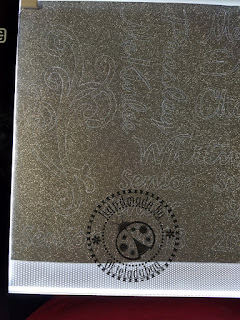 I did consider the Cricut Bright Pad but I couldn't justify the cost for it since I knew there were products out there with a lot lower price tag. I did find one on Amazon and I have to say I really like it! It is super light weight and easy to store. I don't think it will break because true to my nature I dropped it a few times just to make sure it is durable *okie is waiting for this to blow up in her face, or at her feet, one of these days when she is seeing how durable things really are* and it didn't crack or bust. When I started weeding some of the Duck Deco Glimmer Laminate I knew I made a great purchase! I about went blind last year before Christmas when I was weeding a lot of the laminate for ornaments. While that stuff is gorgeous it is terribly hard to see when you are weeding it. You can see in the picture that the lines are clearly visible and this made the weeding a breeze! The link below for the light pad is just like the one I purchased. I love the large space it provides for projects being weeded. Mine didn't come with a handy dandy carrying case like this one does so I do feel a little cheated! HA HA HA So if you are looking for a light pad, or light box, whatever you want to call it I can highly recommend this one! Shirley, I totally agree with you 100%. 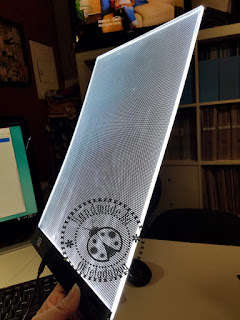 For anyone doing any weeding (vinyl or other medium), stenciling, tracing, or any other craft that a light box or light pad might be needed, I highly recommend a light pad. I really didn't think I would ever need a light pad. However, after trying out my friend's, I couldn't believe the difference it makes. Not just the fact that there is way less eye strain, but it also makes the job so much easier that projects can be completed in 1/3 of the time, or less. Now that I have one, I don't want to be without one again. I also agree with you about the Cricut Bright Pad, which I am sure is a very nice quality light pad ... but so are these and they are a fraction of the price. Why pay more if you don't have to? I saved this email post then later shopped for one of these. I had one saved in my daughter's Amazon account, then she sent me a link to the next one up for a couple of dollars more! So, I ordered it. It came last week, but I told my husband he could use it for a stocking stuffer. I am excited about it. 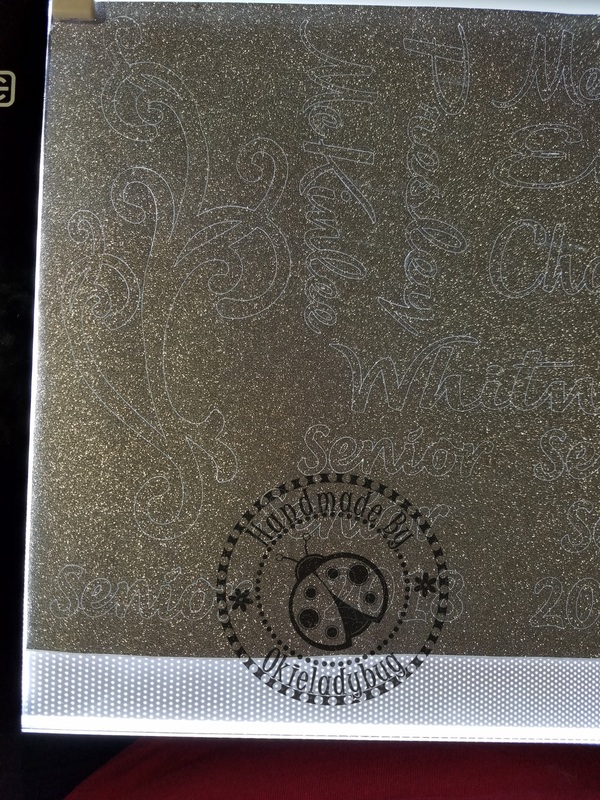 I have a super old thing I got for stenciling with metal stencils YEARS ago, and tried it for weeding, but it didn't work. Thank you Shirley, for all of the great info!! !